Understanding the care needs of your elderly relative. We will speak with you, either face-to-face or over the phone, to understand what care is needed, the type of live-in care that will suit your relative, meet their care needs and agree the fees that are affordable. We will also visit your elderly relative so we get to know them. During the visit we will also review the house for suitability, looking at both the needs of your elderly relative and of the live-in carers, who will need their own place to sleep. As part of our work we will make recommendations relating to changes to the home that are required. This may include any aids and adaptations we think would make it as easy as possible for your elderly relative to stay at home, as well as suggestions of how rooms could be re-arranged for live-in carers. Comprehensive research of live-in care providers. We will undertake comprehensive research of the live-in care agencies in the area that meet the criteria. This includes reviewing CQC inspection results to ensure the agencies meets inspection criteria, reviews of customer comments and speaking with the agencies to find current charges and availability. We will visit the agencies that we think are most suitable, so we are able to make suitable recommendations. We will produce a report of our recommendations on the best way to proceed and present this to you. This report will include a shortlist of suitable live-in care agencies that have availability and meet the budget criteria that was set during initial discussions, as well as our recommendations regarding aids and adaptations. We will discuss the shortlist with you and agree how best to proceed. You may want to talk with the live-in care agencies yourselves or be happy to proceed with our recommended agency. We would recommend that you and your elderly relative have an initial meeting with the live-in carers, so that you can get to know them and identify if there are any potential personality clashes. We can provide assistance with any recommended aids and adaptations as we have developed good working relationships with many organisations who provide these. We would also recommend that where appropriate the agreed suppliers are also retained to fit them as poorly fitted aids and adaptations can be worse than not having them in the first place. We will also recommend “telecare” equipment where appropriate. This can range from pendant alarms and emergency call buttons to pressure sensors, motion detectors and other sophisticated devices. Once you have reviewed the report and appropriate actions have been agreed, we will manage the introduction of the services for you and monitor them until all parties are agreed that they are working and that the elderly relative is safely living at home. If you are currently looking for live-in care for an elderly relative and need help, please call us on 02392 251351 or visit our contact page for other ways to get in touch. 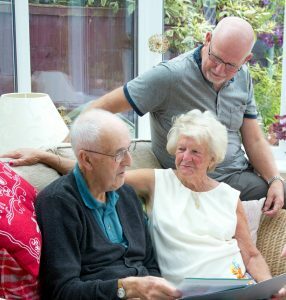 We know how difficult it can be when an older person needs help to stay in their own home and how challenging it can be to find the right live-in care service for your elderly relative. With an unrivalled knowledge of live-in care providers, our experienced advisors can help you find the live-in services that are right for your relative.